I’ve been reading a lot about Watergate lately. Forty years on, this epic abuse of power still has the power to fascinate. At the moment, I’m in the middle of the diaries of H.R. Haldeman, Nixon’s Chief of Staff who was forced to resign because of his involvement in the scandal. Clearly there’s an issue about how far you can trust the journal of a proven liar (Haldeman was eventually convicted for obstruction of justice). Still, there’s much that can be corroborated from the White House tapes that recorded the president’s conversations. I was quite struck by how inefficient Nixon’s working methods were. 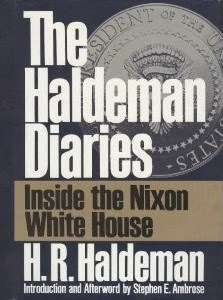 At one point Haldeman comments that he (the President) spent more time complaining about not having time to do things than he did doing the things which he claimed he didn’t have time to do. I’m also reading a good deal on the history of news, for a course I teach at the University of Exeter with my colleague Dr. Sara Barker. I was at the Newseum in Washington DC last weekend and at the airport on the way home I picked up a copy of Ryan Holiday’s Trust Me, I’m Lying. It’s a powerful expose (written from experience) of the corrupt intersection between marketers, bloggers and mainstream news organisations; I’ll definitely be recommending it to my students. Read more about The Roar of the Lion: The Untold Story of Churchill's World War II Speeches at the Oxford University Press website.